Captain Ben and Captain Chad both run fully-rigged Ranger 621FS series 22-foot boats. These boats are capable of handling both the big waters of Grand Traverse Bays as well as the inland lakes in northern Michigan. With a roomy platform from which to fish, these boats are equipped with all the tools to help us be successful on the water. From big Humminbird Helix 10 units on the bow and console to the latest Minn Kota Ultrex Trolling motors and super-quiet Mercury Verado 300s, these boats are built to fish and to fish in comfort and style! 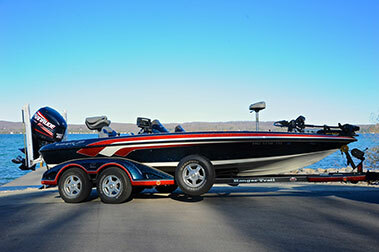 Ranger Boats are the best bass boats in the business and provide comfortable, dry rides for our customers. With plenty of room for casting and raised fore and aft decks, seeing into northern Michigan’s clear waters has never been easier than from these boats. Captain Ron runs a big, 20-foot Lund Pro-V boat that plys the waters of Grand Traverse Bays and the area’s inland lakes with ease. With plenty of comfortable room for customers to stand, cast, and move around – this boat is a fisherman’s dream. Don’t let the fact that it’s a Lund fool you—this is one bass-catching machine outfitted with Minn Kota’s latest Ultrex trolling motor as well as new Humminbird Helix units on the bow and console. These are the boats of choice for legendary anglers and television hosts Al, James, and Ron Lindner. Rods and reels will be provided for your trip. we firmly believe that tackle and equipment should never be the reason for a less than stellar day on the water, and through years of experience, we only use G. Loomis rods, and pair them with Shimano reels. We have technique-specific rods to handle the multitude of presentations that make us successful with customers. 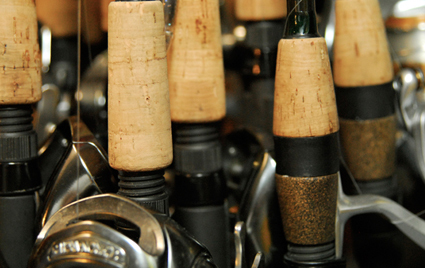 Fly tackle consists of Sage fly rods paired with Hatch fly reels. We pride ourselves on providing top-notch quality tackle and gear for my customers. The equipment will also be in clean, top working condition to allow you to be at your best when hooking and fighting that trophy fish. Even though we always plan on providing the tackle, some customers prefer their own gear, which is perfectly fine. Please don’t hesitate to contact me about which setups will be appropriate for your trip.